No Churn Mint Chip Ice Cream Cake has an Oreo cookie crust and the creamiest mint chip ice cream ever. 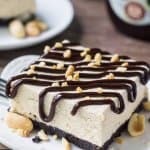 Made from scratch without an ice cream maker – it’s so easy it is to make this homemade ice cream cake! Mint chip ice cream is my favorite. 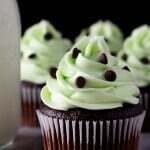 Minty, creamy, chocolatey – what’s not to love??? As a kid I dirtied many a t-shirt with melting mint chip ice cream. And as an adult… well, hopefully I’m a little less messy. But the addiction still runs true. 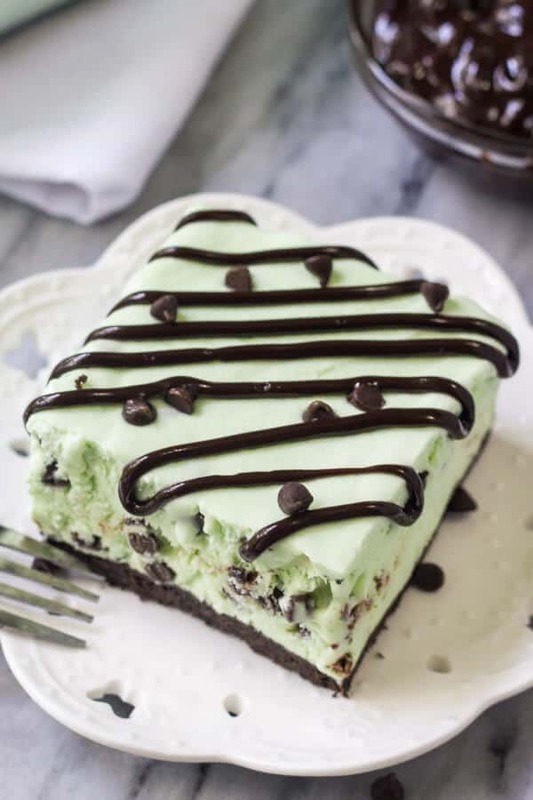 Because seriously – the combination of creamy ice cream, minty deliciousness and chocolate is dynamite. So after making homemade peanut butter ice cream cake the other week – I figured it was time to make its mint chip ice cream cousin. Hello there No Churn Mint Chip Ice Cream Cake. 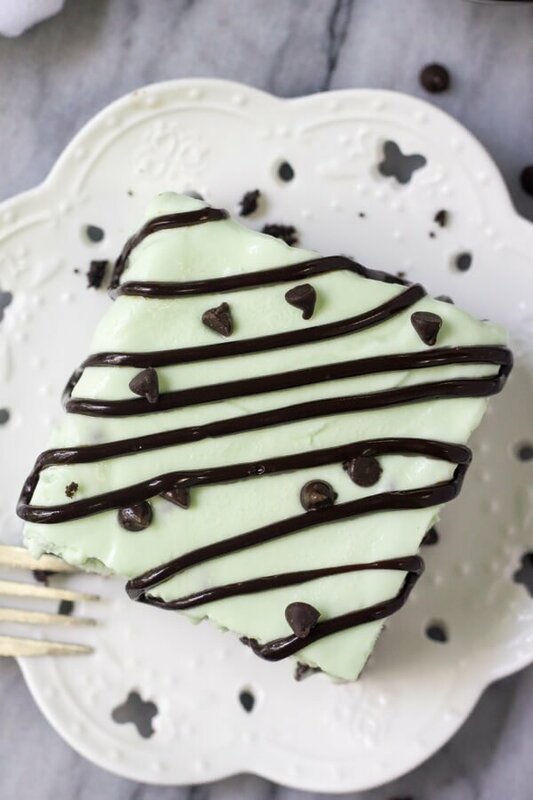 This mint chip ice cream cake is made from scratch and seriously delicious. It has a crunchy Oreo cookie crust. Then a layer of the creamiest, fluffiest mint chip ice cream. And its topped with hot fudge sauce for extra goodness. Yup, it’s that easy. You end up with ice cream that’s creamy, smooth and deliciously rich without needing any fancy ingredients or equipment – and that’s a total win in my book. So to make our mint chip ice cream cake, it’s not much more difficult. For the crust, we’ll stir together some Oreo cookie crumbs and melted butter. Then press it into the bottom of a 9×13 inch pan. After that, the homemade ice cream is spread over the top of the crust. Then the whole thing is placed in the freezer to harden. 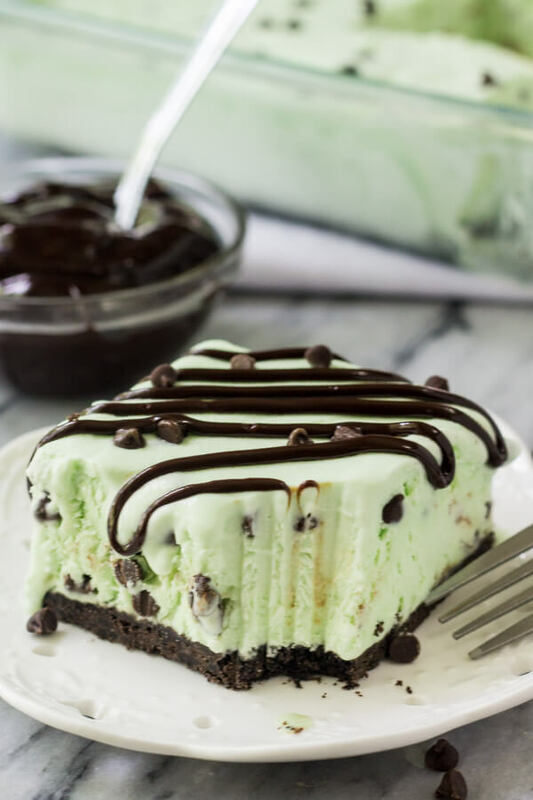 It takes less time than driving to Dairy Queen to buy an ice cream cake, and it’s seriously the most delicious mint chip ice cream you’ll ever taste. 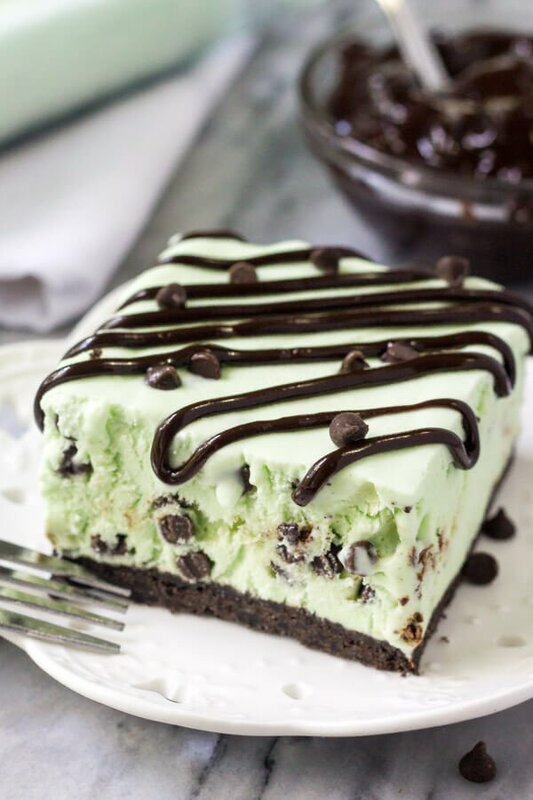 You could easily replace the chocolate chips with crushed Oreo cookies instead and make Mint Oreo Ice Cream Cake too. Either way, you’re going to love this easy homemade ice cream cake! No Churn Mint Chip Ice Cream Cake has an Oreo cookie crust and the creamiest mint chip ice cream ever. 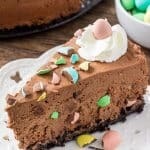 Made from scratch without an ice cream maker - it's so easy it is to make homemade ice cream cake! Press into the bottom of a lightly greased 9x13 inch pan and place in the fridge. In a medium bowl stir together the sweetened condensed milk, peppermint extract, vanilla and food coloring. Stir the sweetened condensed milk mixture into the whipping cream until evenly combined. Then stir in the mini chocolate chips. Pour the ice cream over the Oreo cookie crust, and chill in the freezer for at least 6 hours. Mint chocolate chip is my mom’s favorite too! She would love this. Looks amazing and makes me want to try the recipe!